Paul L. Tsompanas, 81, from western Pennsylvania, passed away on Friday August 24, 2018 at his summer home in Colonial Beach VA , with his wife by his side. As a young boy Paul was fascinated by a weekly TV series which drove him to become a reporter. His writing career began in high school as a sports editor of the school paper. Upon graduating from Penn State with a journalism degree he was off to serve in the U.S. Navy. 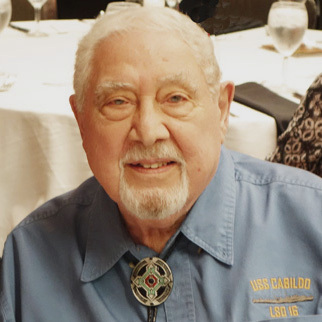 After 2 deployments in the Western Pacific as a communications officer he began to believe that the USS Cabildo stood for "Underway on Saturday and Sundays". In 1960 he became an award winning reporter at the Clovis News Journal in New Mexico. Then in 1963 he was working at the San Diego Tribunes nighttime call-in news desk. One evening an inventor had something he thought was news worthy. Paul's story ran in the next day's paper, introducing the world to the recreational sport known as Parasailing. In 1964 Paul was a part of the Washington bureau of Copley News Service as a Congressional correspondent. Then in 1967 he started work as chief of staff to a Republican Congressman from San Diego. Eight years later was then appointed to the professional staff of the House Armed Services committee. During his time there he attended the National War College. Paul retired from Capitol Hill in 1987. After much research into the great grandfather of his children the book Juan Patron: a Fallen Star in the days of Billy the Kid was published in 2012. Paul was a man that was loved by all who met him. He is survived by his wife, 5 children, 8 grandchildren and one great grandchild. A funeral Mass will be held Friday, August 31, 2018 at St. Elizabeth Catholic Church, 11 N. Irving Street, Colonial Beach, VA 22443. A visitation will be held from 6:00 until 8p.m. Thursday August 30, 2018 at the Storke Funeral Home, 131 3rd Street, Colonial Beach VA 22443. In lieu of flowers, memorial contributions may be made to: St. Joseph's Indian School in South Dakota.